For many Mac webcam users, improving the LIGHTING of your setup may be the single-most effective thing you can do to have a better video conferencing experience. Yes, there are several Mac webcam apps that can help _compensate_ for sub-optimal lighting. However, correcting your lighting setup from the get-go can make using webcam software tweaks unnecessary. Inadequate Light: Insufficient lighting is the number one cause of poor, noisy and grainy image quality. It also leads to lower frame-rates and sluggish response as the webcam's electronic shutter operates more slowly to allow more light photons to hit the sensor before refreshing the frame. Adding a secondary, or sometimes third light source near your computer can make a world of difference. Color Temps: Inaccurate webcam image color is greatly affected by the TYPE of lighting sources you choose. Incandescent and halogen lamps give off very warm and reddish wavelengths. Blue-ish LED or Fluorescent light sources may cause your webcam's image (and your skin-tones) to be more greenish or purplish. By using different types of lighting sources together, you can achieve better video color fidelity, especially during nighttime use when ambient, natural sunlight in the room isn't available. 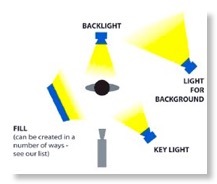 Multiple Light Sources: Use multiple ring lights or lamps, such as one directly in front (Key Lighting), and one or more to the side (Fill Lighting) to help minimize unwanted shadows. Brightness Levels: Using dimmers, or incandescent lamps with 3-Way bulbs can be one way of being able to quickly fine-tune lighting levels. Shades and diffusers can prevent direct lighting glare and 'blowout' of the lightest areas of the web camera's image. Bouncing lights off a ceiling or wall can help improve overall ambient lighting levels at nighttime. Ambient Lighting: Lastly, during daylight be aware of natural light sources like windows. Passing clouds on a sunny day can radically change room light levels quickly. Ideally, you don't want a sunny window of any sort directly behind you in the webcam's field of view. The camera will likely darken your image in the foreground and adapt to the background light levels instead. Backlighting should NOT be the primary source of lighting.